So what do you do if Merlin turns up and tells you that he needs you? What if the fate of the world as you know it depends on you travelling fifteen hundred years into the past to fight a monster with the greatest magician who ever lived? 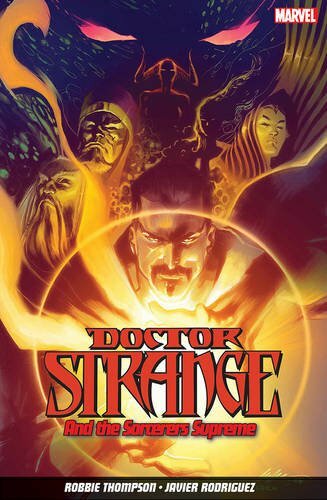 Well, if you’re the Sorcerer Supreme, Stephen Strange, the modern day magical protector of Earth who doesn’t really have any magic left thanks to the Empirikul, you don’t think twice, you hitch your wagon to that of King Arthur’s resident wizard and you do exactly what he’s asked. Which in this case is join a band of fellow Sorcerer Supremes that Merlin has recruited from throughout history in order to fight a beast called the Forgotten, a rampaging, crazed creature that might just be the most powerful wielder of spells and arcana that any of the Supremes (and the temptation to make a Diana Ross or Motown joke at this point is almost too much to bear. Almost…) have ever faced in combat. And the longer the battle rages, and the more casualties that Stephen and his comrades in arms take, the more it becomes increasingly apparent that not everything is what it seems to be and after they’re struck down by treachery and deception, the Supremes (there it is, that urge to make a Diana Ross joke again) real fight to save everything that they cherish and are sworn to protect begins.